Ottawa real estate typically takes a pretty good dip from mid-November until at least mid-February and unit sales drop off 40 or 50% from the monthly average for the rest of the year. It may however be the best time for many to buy a new construction home from a builder. Most builder deliveries are currently being booked for summer or early Fall 2017. For those with an existing home to sell, this means one would end up selling the existing property in peak season in April, May or June to facilitate a closing in the summer time. This is a much better situation than those with January, February or March closings-as these buyers are faced with selling an existing property in the latter part of the year when buyers are fewer and many buyers prefer not to close in the winter months. One of the advantages of buying a new home is that there is lead time to prep and existing property and make sure it is in optimal condition for listing. Given the lead time between now and spring, there is some good “runway” for homeowners to do painting, organizing or minor repairs in advance of listing the property for sale. It also gives more planning time with one's Realtor, mortgage broker, stager and trades or service people. First time buyers can also take advantage of having some lead time to continue saving for their purchase and also take advantage of RRSP contributions for both 2016 and 2017 tax years, before withdrawing those funds to use for the house purchase. Kind of like double dipping and is perfectly OK with the tax man, as long as the funds are deposited for at least 90 days. *We have deals for new construction buyers! We also list homes for a major Ottawa builder, so if we can help them meet their sales objectives, we can certainly help the individual home seller (or buyer!) too. We know new construction and can help you with the process. Is buying Ottawa property to house a visiting student a good idea? Over the years we have assisted many out of town buyers looking to purchase homes or condos to provide housing for their children who are coming to Ottawa to attend one of our large and growing post-secondary colleges or universities. With limited on campus residences and cost factors in mind, many parents have bought apartments, townhomes or homes to accommodate student needs and also as an investment or cost offset. Many have successfully bought and then sold several years later and either made some money or minimized the cost of accommodating the student during their years here in Ottawa. For most of the new millennium, this practice has been pretty positive, particularly for those who have rented out rooms to other students as well as their own children and those parents who have more than one child who will be living in Ottawa during the same period. Now that we are in a period where prices have not been advancing at 5%-7+ annually, as they did during the 2000-2011 timeframe, this practice is no longer the “slam dunk” it was for many parents. We recently completed a sale for an out of town family (now moving to Ottawa themselves) who bought in 2010 in a strong seller’s market and were able to sell this year but only appreciated a very small increase in the price of the property from what they had paid 5 years earlier. While this was disappointing, these owners had kept the property well rented out to other students during the 5 years of ownership and therefore, still came out pretty well financially, despite the limited uptick in the value of the property. Do you want your university age child to bear the burden of ownership and property management? Some out of town parents may not wish to burden their children with the responsibilities of managing and maintaining the property; collecting rent, divvying up utility costs, being a disciplinarian and so forth, in addition to their school work and perhaps part time job. Other parents may deem this a good “learning experience” and see it is as an opportunity. 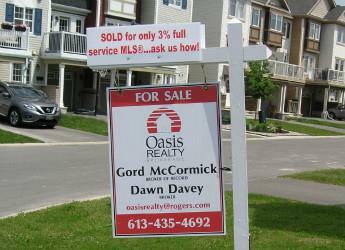 Those considering the purchase of such a property here in Ottawa should carefully research all financial factors in buying and selling in a remote city and the best source of information is a local Realtor who can assist with competitive issues, neighbourhood choice, property choice, local rules, buying and selling costs and so forth. This practice is certainly no longer a “slam dunk” in our competitive buyer’s market and should not be undertaken too casually. For more information or to discuss particular circumstances, feel free to give us a call if you are not already working with another Realtor. Coming soon... mandatory energy audits and the MLTT? Update: August 2017 Thanks to Mayor Jim Watson (and council) the MLTT discussed below has thankfully, not come to Ottawa. Buyers and sellers however, must remember that governments are always looking for new sources of revenue, so we cannot assume that the MLTT (or some other equally costly tax measure) may not land on our doorstep in the future. Since taxes generally only go in one direction, those selling sooner rather than later, may be avoiding the next tax headache that could be coming down the road. Mandatory Energy audits and the MLTT: two good reasons to buy or sell now! Buyers and sellers should be concerned with two pending agenda items on the Provincial Government review list: the potential implementation of mandatory green energy audits and a Municipal Land Transfer Tax (MLTT). If implemented, both of these items will add significant cost and complexity for buyers and sellers, possibly even prior to spring 2016. One portion of the disastrous Liberal Green Energy Act 2009 was shelved but is being revisited and would call for mandatory home energy audits prior to listing a property for sale. While it is hard to disagree with the intent of the program, we feel that making the program mandatory is overkill and will cost Ontarians thousands and thousands of $$. The cost of the audit itself would probably be fairly reasonable, between $350 and $500. The real cost is in the updates necessary to score a better energy rating and the lost market value for homes with low energy scores. Many seniors who have been in their homes for a long time could well be hit with big energy upgrade costs or a loss of their capital nest egg. Upgrade costs would include costly windows, doors, electrical, lighting, heating/cooling systems, insulation and appliances and would run in to some major money. Sellers would have to get all this done prior to selling and would have no choice but to pass along the costs to buyers. Do you want to pay $5,700-$12,200-$20,200 in land transfer tax? The MLTT has been in existence in Toronto for 7 or 8 years now and generates some $350-$400M annually in tax revenue. While city officials in Ottawa have indicated they have no interest in implementing the MLTT here, it is clear that the Provincial Government is all about finding new “revenue tools” and Ottawa has some huge projects to finance (LRT and Ottawa River clean-up to name but two). A large part of the funding for these projects is expected to come from the debt ridden treasury of the province. So the money has to come from somewhere, either higher provincial income taxes, property taxes, special taxes like the MLTT or some combination thereof. The city could be forced in to implementing a Toronto like MLTT in order to fund committed projects without drastically raising property taxes. So while nothing is for sure, never trust the shifting winds of politics and politically feasible methods of taxation. (especially with a debt ridden majority government!) Both of these measures could be in place by this time next year, so if you need another reason to be buying or selling this year…this might be it! Why do most buyers want "move-in-ready?" Most first time or “move up” buyers will bend or stretch their financial budgets or comfort level to get as much home as possible for the money. This means that once the property is secured, any further investments must be financed out of cash flow, savings or lines-of-credit which is generally less favourable and more costly than using lower cost mortgage money to get a property that is “done”. If buyers have to rely on 3rd parties to make desired or necessary improvements, significant cash may be involved. Doing kitchen or bathroom reno’s, finishing a basement, replacing roof shingles, furnaces and air conditioning, flooring or landscaping can run in to some serious money. Even having a home professionally repainted can be quite expensive. Country properties on private well and septic systems have a whole host of other systems and equipment that can require significant replacement or upgrading costs. Many buyers also know that the time and energy required to research, hire and trying to manage contractors can be a challenge. Also, living in a construction zone for even a short time is not a lot of fun and even more difficult for those with young families or pets. If many projects are required the overall timeline can become extended and seriously detract from one’s enjoyment of the home. This is the “will-it-ever-be-finished?” syndrome that few want to experience. If most buyers prefer properties with the highest “move-in-readiness” score then properties with significant updating to be done, have a much smaller pool of buyers who will consider the property. Often times these buyers may be bargain hunters, house flippers or other investors who will seek to find bargains at the lowest possible cost. If these properties languish on the market for an extended period then they may be subject to really “low ball” offers. Fewer buyers=less demand=less competition=longer time to sell=lower market value. Another good step can be to have a pre-listing home inspection done which will help point out areas to be updated/repaired/replaced/maintained and what the approx. costs may be. Buyers will benefit from their home inspector and Realtor who can also help them assess repair and updating requirements and the timelines necessary prior to firming up a sale. Full service and lower commissions! In our long running seller’s market which left us sometime in the last 3 years (mid 2012 by our reckoning), it was no problem. Market demand was hungry for listings and most reasonably priced properties sold quickly, so those both buying and selling did not have to fret too much about getting their existing property sold after first finding the house they wanted. 2015: … not so much! Current homeowners who buy first and then try to sell an existing property cannot be 100% sure that the property will sell; what it will sell for or when it will sell. This is especially true for those buying new construction that may be committing up to a year or more ahead of time and are not able to choose the time window for selling an existing property, since the builder dictates availability of the new home. Since many buyers stretch their budgets to obtain their “dream home”, any shortfall in what they obtain on selling the existing property can be troublesome. Not being able to sell a property quickly is also a concern and can lead to a lot of stress and sleepless nights for those who had expected their existing property to “sell in a week or two”. Your Realtor can help with appropriate strategies and processes such as a “first refusal” offer to purchase or listing an existing property “subject to the availability of a specific property”. These processes can be delicate and are not for the amateur seller who might end up owning two properties or no properties by trying to buy and sell at the same time. A Realtor may also be able to assist with securing a rental property as an interim step, particularly if one is selling a property above $500K or the closing on the new property is a long way out, as can be the case in new construction purchases. Make sure and have a realistic discussion with your Realtor about not just listing price but expected selling price (best case and worst case scenarios) and how long it should take to sell. Be prepared for some bad news and adjust your pricing expectations accordingly, as the market dynamics are dictating-don’t simply list with the Realtor who tells you what you want to hear. If you are not working with a Realtor then by all means give us a call and we would be happy to have that discussion with you and which of our tiered commission structures and marketing plans will work best for you in the 2015 market. -engage a REALTOR® who is a good personal fit and will be able to respond to you how and when you wish. -consider all housing options in your price range: new construction, resale homes, condo vs freehold etc. and eliminate choices as you go thus creating better focus. -have an appropriate auto search set up and respond quickly when you see new listings appear. -Google, Mapquest or Bing maps should be your best friend. You can avoid houses with undesirable locations or nearby features ie hydro wires, busy roads, commercial buildings etc. -nothing is better than walking around a street or neighbourhood on the evenings or weekends when people are out and about. You can chat with neighbours and get an idea of neighbourhood demographics. -if you have an existing home to sell, make sure it is ready to sell and you have an agreed plan on how to market it and a realistic sale price expectation. -don’t engage in “low ball” offers unless there is some reason indicating you should: this just wastes everyone’s time. -remember that the house should be more important than the “deal” and don’t attempt to “win” every last detail in the offer negotiation. -don’t engage in extended negotiations on offers-this is stressful for all and may allow another buyer to surface.